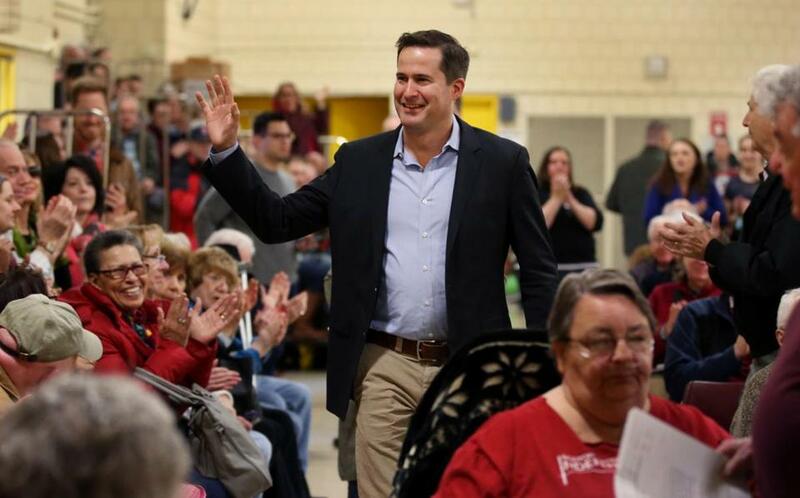 Representative Seth Moulton arrived for a town hall meeting at North Shore Community College in Lynn on April 8. He has won praise from a neoconservative magazine editor, taken star turns on HBO and “This American Life,” and likened President Trump’s political ascendance to that of Adolf Hitler. The 38-year-old won his seat in 2014 by tackling a longtime incumbent of his own party. A decorated four-tour Marine veteran of the Iraq War with three Harvard degrees, he took out John Tierney in the Democratic primary. “He’s a combat veteran. I think he operates, and he learned how to operate, with courage, and he operates with courage daily, and I think that’s unique,” said Emily Cherniack, who helped recruit Moulton to run in 2014 and founded New Politics, which assists candidates with backgrounds in public service. Could it be Kennedy vs. Moulton? These two smart, seriously ambitious politicans are engaged in a quiet battle for standing in a party looking for fresh faces. Speculation about prospective Democrats has begun to ripple through the party, most recently stoked by former vice president Joe Biden’s trip Sunday to New Hampshire, the nation’s first state to cast presidential primary votes. The escalated activity prompted a New York Times story Monday about the ranks of potential 2020 contenders, noting that Moulton has not ruled out a run in private conversations. During the previous administration, Moulton also objected to President Obama’s Middle East strategy, part of his pattern of taking on party elders. Last year, he threw his support behind Ohio Democratic US Representative Tim Ryan’s unsuccessful bid to wrest the House minority leadership from Nancy Pelosi. 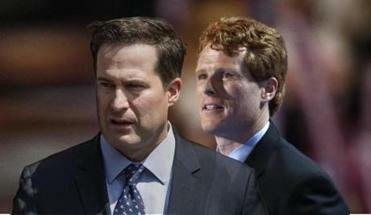 Moulton confidantes downplay persistent Democratic rumors that he would seek to oust Democratic US Senator Edward J. Markey in 2020, saying that Moulton himself has never voiced a desire to do so. Moulton has said he will not challenge Republican Governor Charlie Baker next year. And the official line from Moulton staffers is that an Oval Office bid in three years isn’t in the cards, either. Moulton is far from alone in the state’s Washington delegation in seeking to join the anti-Trump vanguard. Senator Elizabeth Warren has repeatedly attacked Trump on a range of issues. US Representative Katherine Clark, the Melrose Democrat, has ratcheted up her own profile in a similar vein. A critique by US Representative Joseph P. Kennedy III, just a few years younger than Moulton, of a GOP effort to repeal the Affordable Care Act went viral. Moulton has also demonstrated a willingness to flout the dictums of party seniority in a way most of his colleagues have not. His 2014 primary challenge to Tierney was frowned upon by party leaders, ill feelings that have not faded entirely among some establishment Democrats. Still smarting from Trump’s election, some Democrats are pondering what lessons to take away from November and wondering whether their party’s biggest names — including Warren and Biden — are too old to take on Trump, who would be 74 on Election Day 2020. Party strategists are also concerned about their party’s messaging on the economy, particularly since Trump snatched previously blue Rust Belt states that have been stung by manufacturing’s decline: Pennsylvania, Michigan, and Wisconsin. Moulton has an answer there, too, encouraging his party to talk about the challenges posed by automation. Joshua Miller of the Globe staff contributed to this report. Jim O’Sullivan can be reached at jim.osullivan@globe.com. Follow him on Twitter @JOSreports.